Sunday morning saw us waking up to a rather soggy field after last night’s heavy rain. We strolled down to the farm house to pay for our camping, fabulous value at six Euros! Madame was sitting in a large kitchen with a huge range, and cats and kittens all over the place, and rabbits in cages, and hens and geese pottering in the yard. 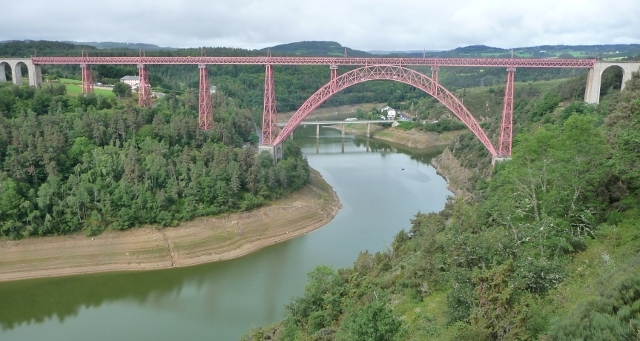 We then picked up croissants in Clavières, and headed towards the Viaduc de Garabit to eat them overlooking the view. The bridge is one of Gustave Eiffel’s works, which was a trial run for the engineering techniques later used in his eponymous Tower. Next stop St Flour, a town perched atop an oblong hill, which was full of life with the local country show right in the middle of town. Being still quite early in the day, we managed to park up right next to the show and strolled in beside prized animals. Newly washed, brushed and polished – huge bulls, chunky heavy horses and their foals, goats, sheep, tiny ponies with tiny children on them, all gloriously chaotic … and the wet ground underfoot soon dried up as the sun came out and blazed on the day. There was lots of activity in the centre of the square show area with steam driven contraptions of all sorts just getting going. 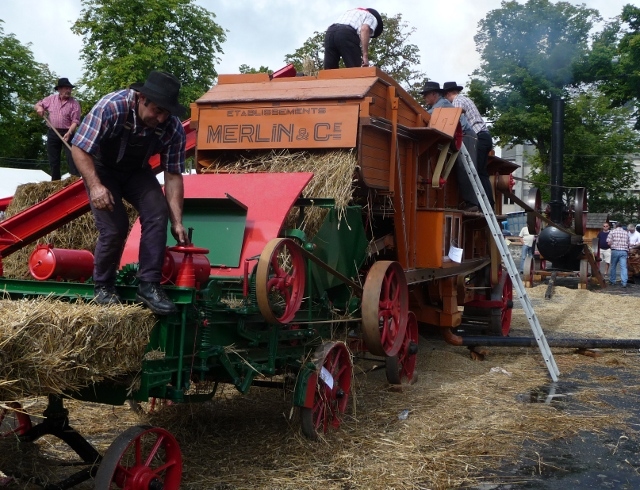 Traction engines’ shrill whistles and everything from a 1950s threshing machine and baler to a band saw turning tree trunks into planks. A huge display of tractors, old and new, all with their engines left running. A rope making demonstration, a blacksmith and his trainees playing with giant bellows. And round the edge of the fair, craft and regional food stalls, with lots of tastings which we freely partook of (as ever). Most notable was our lunch snack of Cantal cheese crêpes and tasty micro brewery beer served by the brewer himself. It was hard to tear ourselves away from the buzz and fun, but we wanted to make progress towards our next date with friends in the Charentes. The road took us through some stunning scenery as we climbed westwards into the Cantal mountains and over the Pas du Peyrol. Luckily most of the traffic was coming towards us as this was one of the busier stretches we had come across. We were making for picturesque Salers (a cheese and breed of cattle), but we were put off actually visiting this small place as it was so totally surrounded by huge crammed car parks it looked to be more like a theme park than a working village. A Sunday afternoon in August was definitely the wrong time to visit! We camped in the valley of the Maronne river by the Enchantet reservoir at the Plage de Longayroux, where we met fellow Brit, Patrick Murphy, who was installed in his caravan on this municipal site with his missus where they had spent the last 31 summers. Early on Monday morning, we climbed the hill out of the valley through some very pretty sleepy hamlets. Boulangeries (in this area at least) are closed on Mondays, so it wasn’t until we reached the larger town of Argentat over the border into the Dordogne that we had our breakfast pains au chocolats by the river. 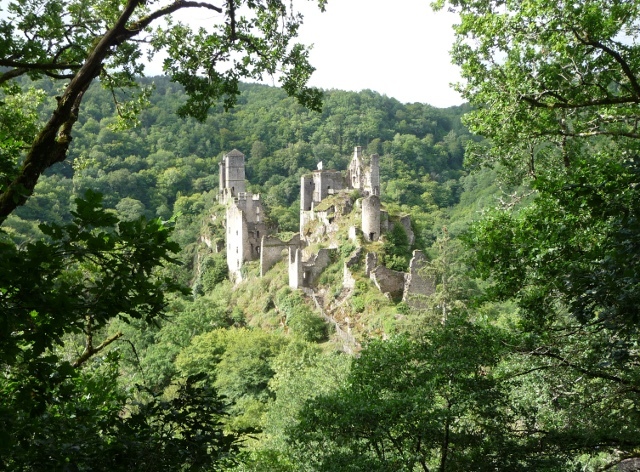 On the way there we had followed a sign towards Tours de Merle not really knowing whether it was a geographical feature or what, but we came across this magnificent almost hidden ruined castle glimpsed through trees. Beyond Argentat … it all started to go wrong as we headed out of town on the D12 alongside the Dordogne river. We pulled into a tiny layby to check the map, and as we started off again … the Clunk of Doom struck. 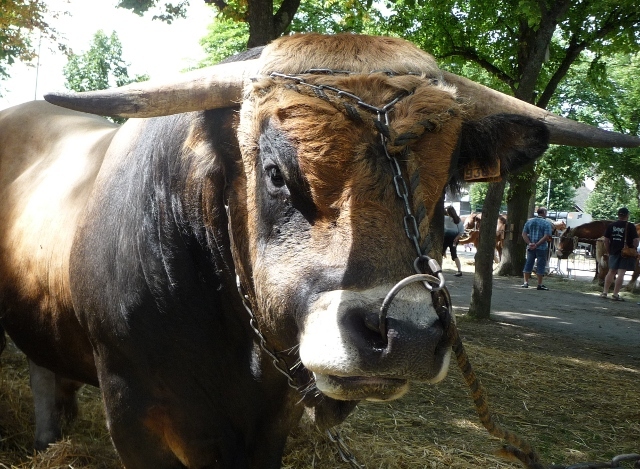 This entry was posted in By Country - France, Food stuff, Travel stuff. Bookmark the permalink.